Open the Season with Style and Savings by Installing a LARSON Storm Door - Spahn & Rose Lumber Co. When the leaves begin to change color, it’s time to weatherize your home with LARSON storm doors. Form meets function with these stylish doors that’ll refresh your home while improving its energy efficiency. Better still, the LARSON Be Wise and Weatherize Sale begins September 17 and runs through the end of October. Spahn & Rose customers can receive rebates off already low-priced LARSON storm doors. 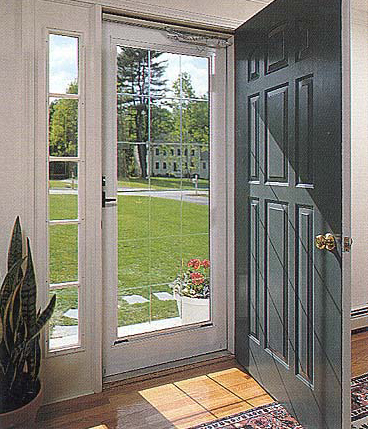 In addition to their durable construction, LARSON storm doors give you the best of both worlds—light and ventilation. Their Screen Away feature offers one-touch adjustment: The screen is stored in a hidden cassette at the top of the door, enabling you to easily slide down the screen (and slide away the glass) to your desired ventilation. Simply reverse the process to restore the full window glass. With the kind of sturdy reliability you demand, LARSON storm doors’ innovative design also features additional weather stripping ideal for harsh weather: The harder the wind blows, the tighter the seal. The doors, with a maintenance-free, baked-on enamel finish, are available in several attractive colors. Built-in hardware comes in multiple finishes as well and offers the protection of a keyed lock and deadbolt. Another LARSON innovation is its hidden closer and Click & Hold technology. Tucked away on the inside of the door, the closer mechanism provides a much cleaner look than traditional storm-door closers. Click & Hold enables you to keep the door open if needed—no more fumbling with a clunky stopper. Finally, thanks to LARSON’s EasyHang System, installing is a simple do-it-yourself project. You can even custom-build the exact storm door to suit your needs.